One of the things that many clients fear the most is anesthesia. This need not be the case! As a veterinarian, I have been using various anesthetics for over 40 years. Over the years I have seen the development of many new drugs and the drugs that we are currently using are so safe that we do not hesitate to anesthetize any pet that needs to have a procedure done. For those of you that like details, let's go over some specific drugs and anesthetic protocols. LOCAL ANESTHETICS - These drugs are injected into the body to create a desensitized area of the skin, or sections of a limb. Although very commonly used in human medicine, many of our pets will not cooperate and physically holding them still might be more dangerous to them than using a general anesthetic. So local anesthesia is used mainly for small growth removals on areas of the body where the pet will tolerate manipulations awake. Examples of local anesthetics are Lidocaine and Carbocaine. INJECTABLE ANESTHETICS - These drugs are usually used for either very short procedures, or they may be used to "induce" anesthesia and are then followed by introduction of a gas anesthetic agent to continue the anesthetic procedure. Examples of injectable anesthetics are Propofol, Ketamine/Valium, and Dexdomitor. Propofol - this is the state-of-the-art injectable drug for humans. It is our most commonly used injectable anesthetic, since it does not depend on the liver or the kidneys for its elimination. Propofol can provide complete anesthesia and additional doses are not additive, meaning that your pet will be awake within minutes of the final dose. Ketamine/Valium or Ketamine/Midazolam - this combination of drugs is extremely safe and can be used to induce anesthesia in most species, or it can be used for very short procedures. Longer procedures necessitate the addition of another drug. Dexdomitor - this is a very unique drug. It will cause profound sleepiness and muscle relaxation. It is most commonly used for very short procedures. It is ideal, for example, for use in radiology where proper positioning is not possible in the awake pet. The great thing about this drug, is that we can inject a second drug called Antisedan that will completely reverse the Dexdomitor. This enables us to send your pet home within minutes of the procedure. GAS ANESTHETICS - For procedures longer than several minutes, gas anesthetics are the safest way to go. In humans and in our pets, gas anesthetics are delivered with a special anesthetic machine. 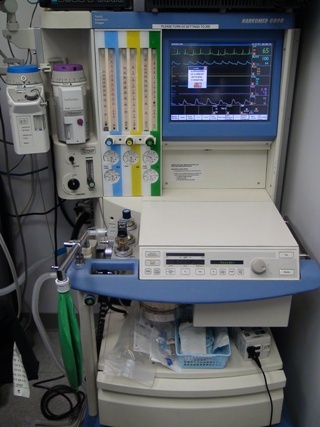 Anesthetic machines basically are a source of oxygen and a mechanism for vaporizing a special agent that causes anesthesia when breathed into the lungs. Gas anesthetics are administered through tubing that is then connected to an "endotracheal tube" which is placed into your pet"s windpipe. With this setup, it is possible for us to have complete control over your pet's breathing, which is essential for absolute safety. Being in complete control allows us to administer the exact amount of anesthetic that your pet needs, providing us with the safest form of anesthetic possible. Examples of gas anesthetics are Isoflurane, Sevoflurane, and Desflurane. At St. Charles Animal Hospital, all of our Gas Anesthesia machines are advanced human models with built-in monitoring capabilities. Isoflurane - this anesthetic is the most commonly used gas anesthetic in veterinary medicine. It is safe and effective in almost any pet. Once the anesthetic is turned off, your pet will awaken within minutes. Sevoflurane - this is another gas anesthetic that has been proven to equal in safety and effecacy to Isoflurane. At this point, it is hospital preference, whether they use Isoflurane or Sevoflurane. Desflurane - this is the newest and possibly the safest gas anesthetic for humans and animals. When this agent is turned off, your pet will awaken within seconds! The downside to this drug is the price. This gas requires a very special vaporizer, making it a very expensive drug for veterinarians to use. Fortunately, we have this drug readily available for your pet. St. Charles Animal Hospital is probably the only place in the metropolitan area that can offer you a choice of Isoflurane or Desflurane! Feel free to discuss your options with your doctor. Respiratory Monitors - No system is more important to monitor than the your pet's respirations. There are multiple ways to monitor respiration. The easiest way is to visually observe chest movements. This, however, is not adequate in many cases, so we have two electronic monitors that help us. We have an Apalert Monitor that makes an audible beep with each breath and displays to us the number of seconds between each breath. An alarm is always set to tell us if too many seconds go by without a breath. We also use an Electronic Volume Sensor that displays how big your pet's breath is. Once again, there is an alarm that can be set to any volume of air that we choose. When your pet is under gas anesthesia, we also visually watch the bag or the bellows that moves with each breath. Anesthetic Level - Our advanced anesthesia machines analyze each breath in and each breath out and display exactly the level of anesthesia that is in the breathing circuit. Electrocardiograph Monitor - We always monitor the electrical activity of the heart. This is critical with anesthesia, since electrical disturbances or arrhythmias can be picked up easily and treated if necessary. These monitors also constantly display the heart rate and make audible beeps with each beat. This makes it easy to monitor your pet, both by sound and electrical wave patterns. Pulse Oximetry - A Pulse Oximeter measures the percentage of hemoglobin that is saturated with oxygen. OK, in English, that means that it monitors how well the Red Blood Cells are being Oxygenated by the lungs and pumped by the heart. This is a very sensitive instrument and can alert us to any combination of poor respiration or poor circulation. Once again, we have both audible and visual output. End Tidal CO2 - Most veterinarians do not have these monitors because of their expense. We have these monitors at every anesthetic station because they give us additional valuable information about how well your pet is exchanging Oxygen for Carbon Dioxide. The machine takes a sampling of your pets exhaled air and analyzes it for carbon dioxide. If your pet's breathing is too slow or too shallow the carbon dioxide will start rising. This is a much better way of analyzing respiration than just observing your pet breathing. Blood Pressure - Blood pressures are routinely done in humans to monitor depth of anesthesia. This is an essential monitoring technique in pets as well. Blood pressure can be monitored by a simple cuff that is placed either on a leg or a tail. Several different machines are available for use in dogs and cats, depending on your doctors preference.